Is processing your aircraft expendable orders like cleaning a toilet? It’s messy, time-consuming, and there are more productive things you could be doing. But whether you like it or not, these low value, high volume items are an important asset to your fleet. Yet, they take up a ton of time. Sit back in your chair for a moment and think of all the time you and your team spend processing expendable material. Now add up the hours and you’ve just calculated a portion of your Total Material Costs. Total material costs is a huge factor to a successful operation. The lower you get it, the better, and it’s not all about price. The more you source, process, chase and trace the more you’ll see your material costs increase. Just run some basic numbers through this Total Material Cost calculator. And the more you stock in inventory, guess what? Yup, you nailed it again, the more you’ll see your total material costs increase. It’s a dance of processing and stocking. And if the balance is off, you’re stuck with unnecessary costs. 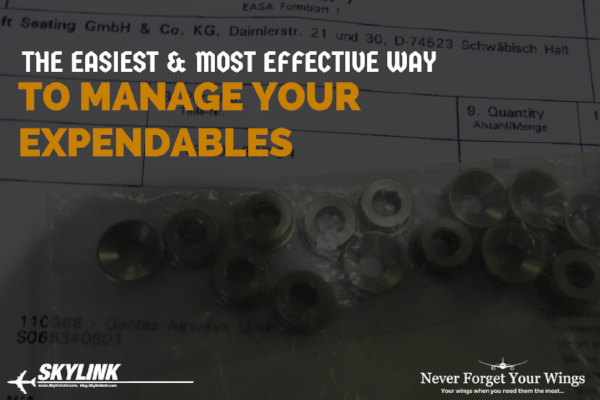 So, the question remains, how can you reduce the time you spend on sourcing and processing aircraft expendables? Is there something you can do, right now, that’s low-cost and easy to implement?? Before I give you this simple trick, I must warn you, it’s going to sound really easy. You’ll think to yourself, is he serious? And yes, yes I am. You know sourcing and processing this material is difficult, especially if you need 100 line items---this week. The multi-line need is the biggest logistical problem we see. And shipping a $5 washer is expensive! All these variables are when things start getting harder to manage. Have a primary trusted material adviser who specializes in aircraft expendable and consumable material. Because you want to streamline your communication. This doesn’t mean you won’t have others, but you’ll have one, primary trusted material partner who you can rely on. Who you can call, text, and email 24/7. Your operation is dynamic. You always have something going on so the faster you get support, the better. The communication flow is fast and easy. With a trusted aircraft expendable partner you can be sure this is what they do every day, with hundreds of other airlines, MRO, lessors, military and OEM clients. I must warn you before you take me up on this strategy, make sure that it is, in fact, someone you TRUST. This is one of the most important points I can give you. You don’t want someone overpromising and under-delivering on a critical project, am I right? The second point is to make sure their operation can support 90% of the aircraft expendable and consumable material you need. Otherwise, this strategy will flop. Decide on a trusted material adviser. Send them an initial RFQ of 10 to 200 items you need for an upcoming project. Sit back and let them show you what they do. P.S. We support international fleets with all expendables and consumables. Care to chat? Click here and let’s discuss what you’ve got going on. Newer PostTAP Portugal Supply Chain Planner breaks down his problem solving strategy. Older PostWhy Are Expendables And Consumables So Hard To Manage?